Love the chart. Love the goals. 1000 miles comes out to about 20 miles a week, so if you run 3 or 4 days a week, it’s a reasonable goal. I’m ready to read some more great Booth fiction again!!! 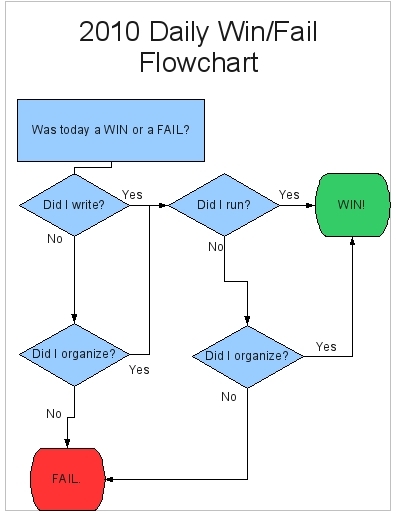 Flowchart FAIL! (Or maybe I should have just labeled it “Flowchart Beta.”) I was trying to avoid loops or identically-labeled boxes. Check out the new one: It might be clunky, what with two “Did you organize” boxes, but (I think) it works. Thanks again for all the encouragement!